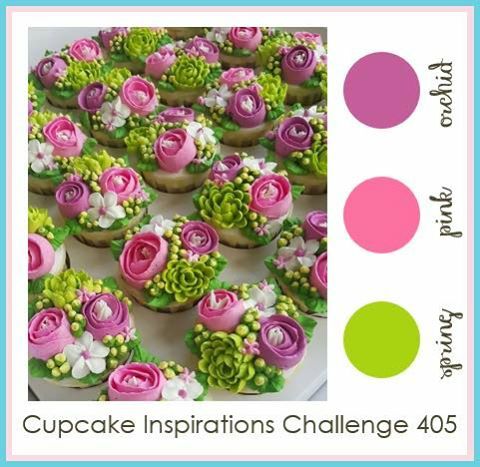 How fun that Frantic Stamper is the sponsor for the challenge today at Cupcake Inspiration, so I wanted to play along. The inspiration colours come from the following picture. 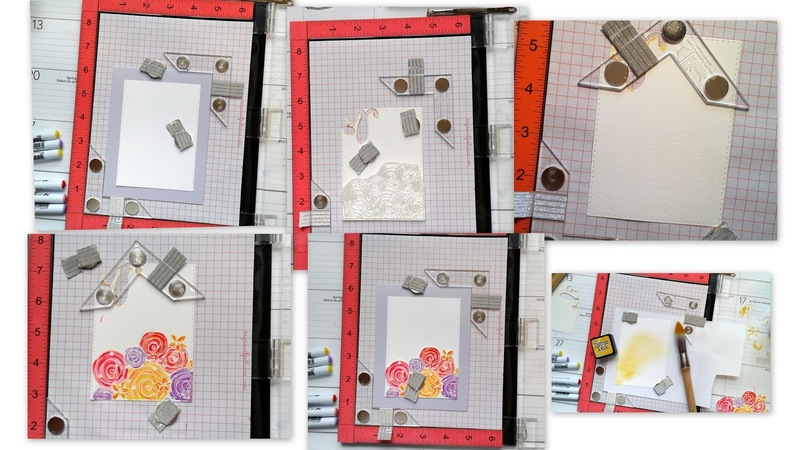 For my card I have used stamps and dies from the new release "Life Moments" for May, along with a couple previously released. My background is the new beautiful background stamp called Confetti and Streamers which I inked up with the colours shown in the picture, adding a green matting. 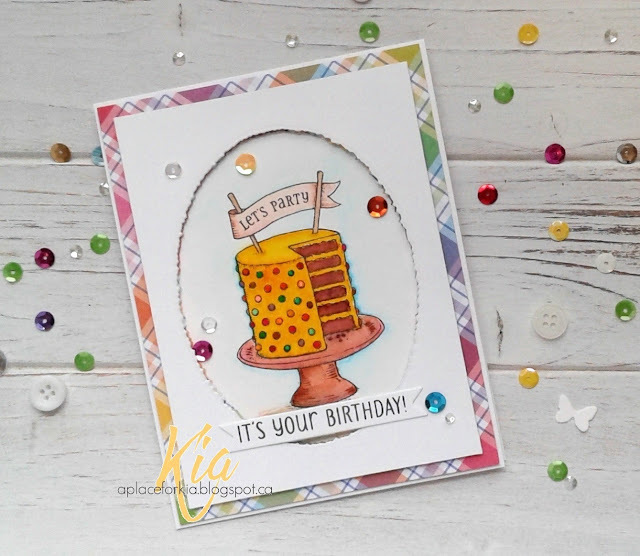 I stamped the candle from the Celebration stamp set to and die cut with the Deckled Circles die, attaching with foam strips. I die cut the Streamers which I sponged using the challenge colours and styled before attaching to the deckled circle. For my sentiment I used the Sassy sentiment from the Sassy Birthday Stamp Set and finished with a few sequins. Thanks for having a look and for visiting my blog today. Products: Frantic Stamper Confetti and Streamers Background Stamp, Frantic Stamper Deckled Circles, Frantic Stamper Streamers, Frantic Stamper Sassy Birthday Stamp Set, Tim Holtz Distress Inks Picked Raspberry, Wilted Violet, Twisted Citron, Simon Says Stamp Intense Black, Neenah Cardstock, Sequins, Foam Strips. We are celebrating World Penguin Day for the Clean and Simple Challenge at Splitcoastampers, and who doesn't love penguins. This little fellow is so cute, he reminds me of the movie Happy Feet, which I loved. I stamped him using blue embossing powder on watercolour paper and coloured with Zig brushes. 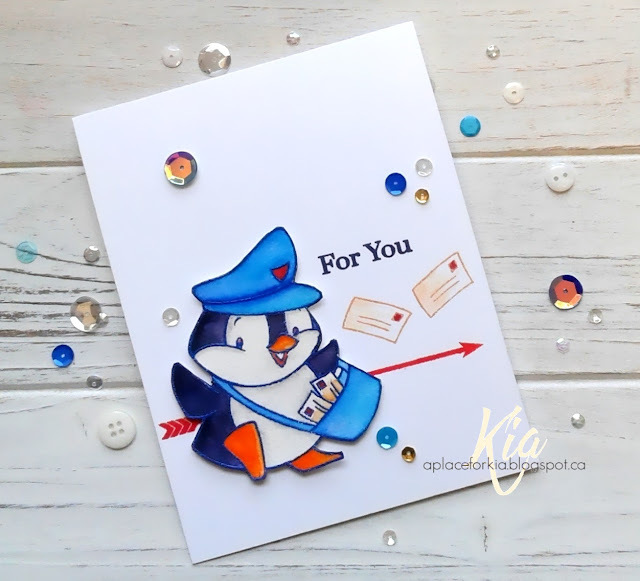 I then stamped the arrows along with the envelopes and sentiment on the card base and fussy cut the penguin, attaching with foam strips. And, yes, sequins for a bit of bling. Such a fun little guy to paint ... thanks for visiting my blog today. Products: SugarPea Designs Happy Mail Stamp Set, Zig Brushes, Tim Holtz Distress Inks Candied Apple, Chipped Sapphire, Blue Embossing Powder, Foam Strips, Sequins. 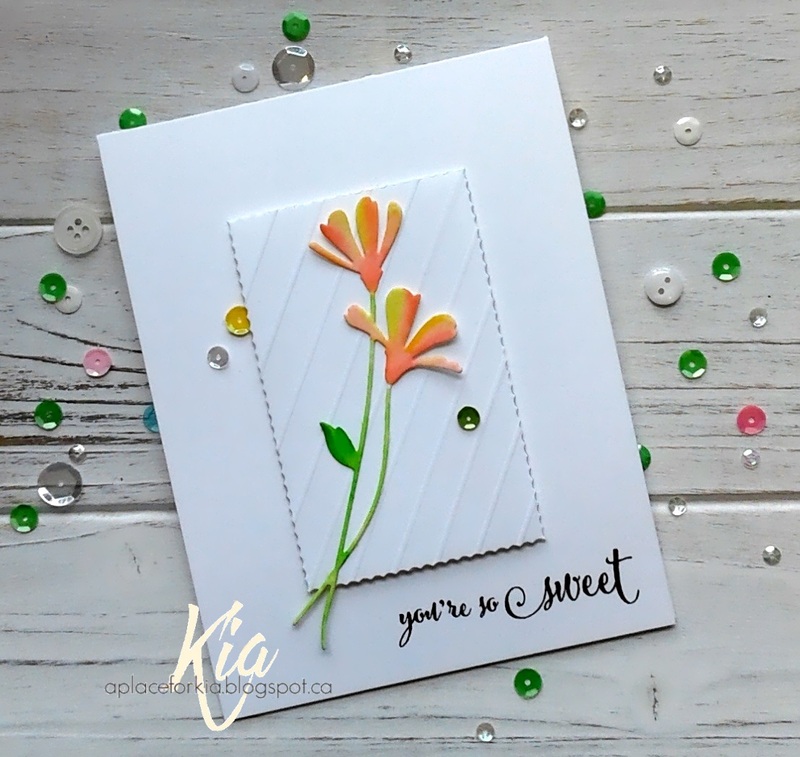 "So Sweet" I made to send to a friend to thank her for her sweet gift. 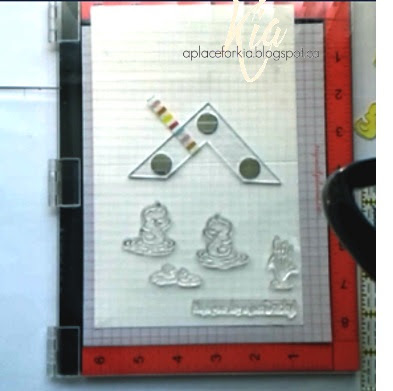 It is rare for me to use scoring on my cards, and the idea today came from the inspiration challenge at Splitcoaststampers with a visit to the Scor-Pal Pinterest Boards. There are many ideas for fancy folds and boxes at this site, very worth a look. For my card I die cut my panel and scored at half inch on a diagonal and attached to my card base on foam strips. 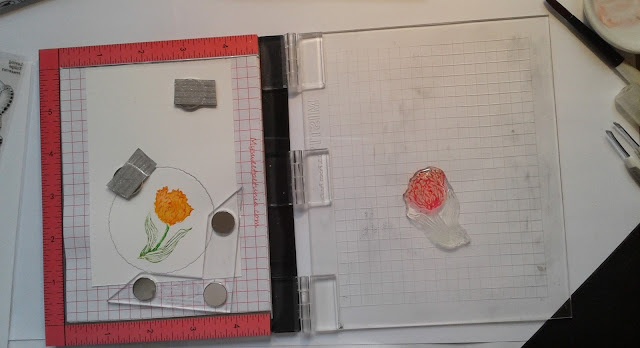 I die cut my daisy using watercolour paper and painted with Zig brushes in yellow, light carmine and light green. I finished by stamping the sentiment and adding a few sequins. Products: Simon Says Stamp Fresh Daisy, Memory Box Scalloped Stitch Trimmings, Scor-pal, Penny Black Sprinkles and Smiles Stamp Set, Neenah Cardstock, Fabriano Hot Press Watercolour Paper, Zig Brushes, Sequins, Foam Strips. 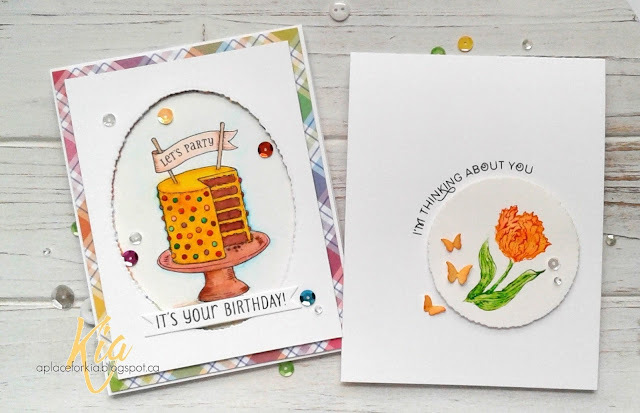 I am delighted to share my post with you for today's blog hop joining My Sweet Petunia with SugarPea Design Stamps. I will have more information on the hop and the prizes below, but first I would like to share the cards I made for today's hop. 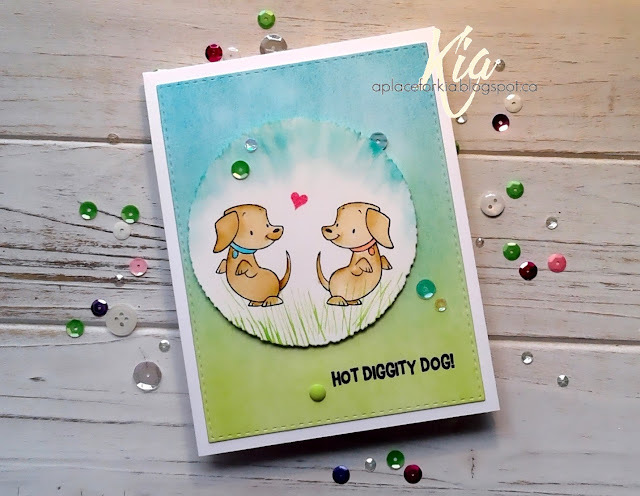 The first card I am sharing with you is made with my Mini Misti and the Hot Diggity Dog stamp set. I started my card by applying the colour for my background with clarity brushes and die cutting with a stitched recangle die. I then die cut the deckled circle and in my Misti arranged the doggies as I wanted and stamped with Intense Black ink, then proceeded to watercolour them with Zig brushes. I added the grass and sponged on some peacock feathers around the top edge then attached to my card on foam strips. 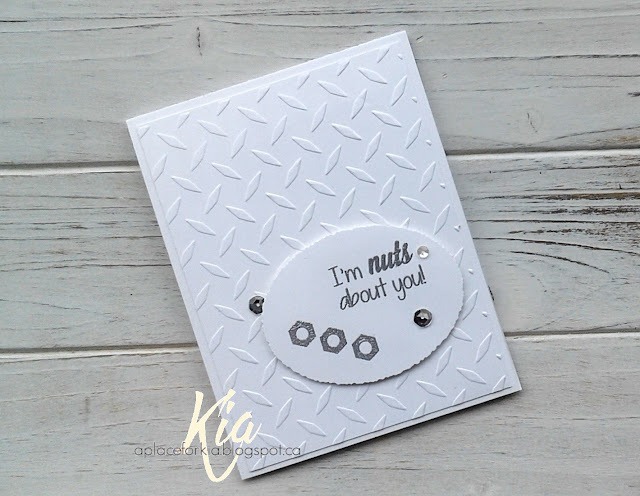 I placed the card back in my Misti and stamped the sentiment. A heart from the set and a few sequins finished Hot Diggity Dog! 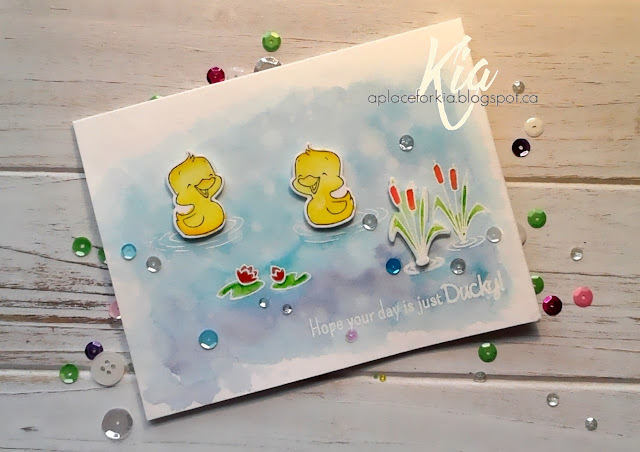 With distress inks I then water coloured the background and separately the ducks and another flower. 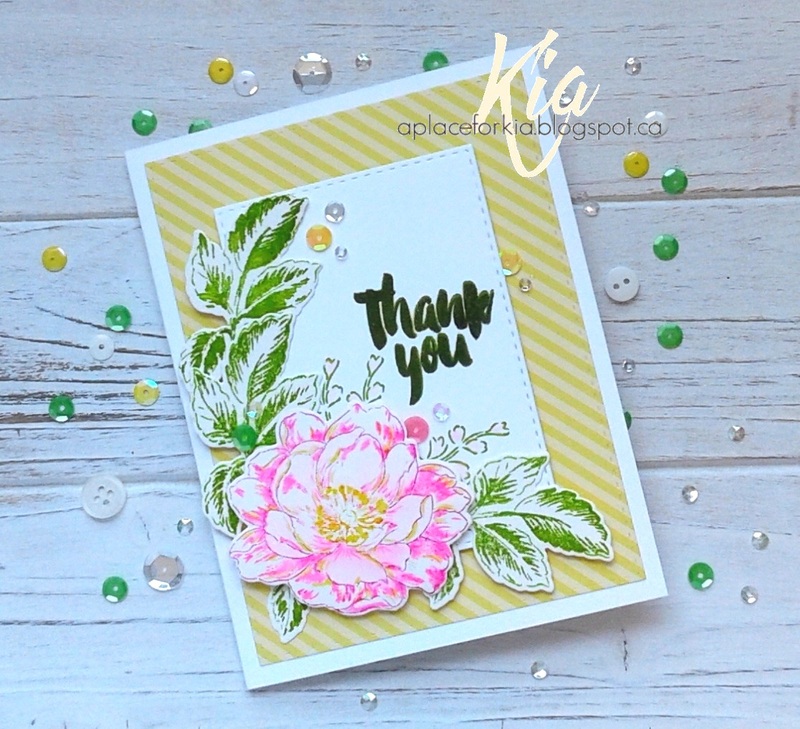 Once my background was dry I sprinkled water on the card, giving it about 30 seconds to react with the distress inks, then attached the die cuts, and finished with my trademark sequins. 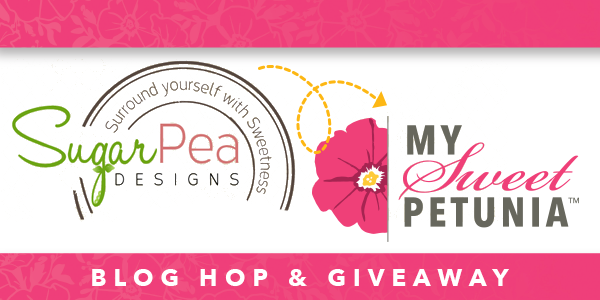 From My Sweet Petunia your choice of either the Mini Misti or the Original Misti, and from SugarPea Designs there are two (2) gift certificates of $25.00 each for two (2) winners. For a chance to win you must comment on each blog. 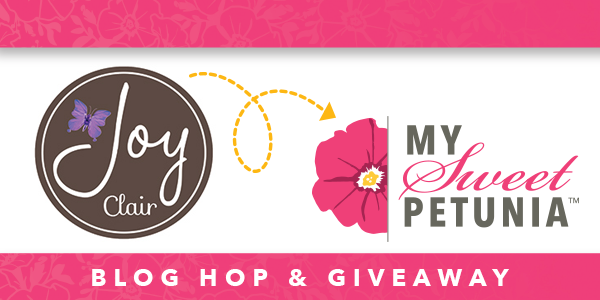 The winner's will be announced here for the Misti, and on the SugarPea Blog on April 28th. You should have arrived here from Simonne Clay's Blog. Products: My Sweet Petunia Mini Misti and Original Misti, SugarPea Designs Hot Diggity Dog Stamp Set, Quakers Stamp and Die Set, Frantic Stamper Deckled Circles Die Set, Simon Says Stamp Stitched Rectangles, Tim Holtz Distress Inks, Clarity Brushes, Simon Says Stamp Intense Black Ink, EmbossIt Ink, Zig Brushes, Neenah Cardstock, Strathmore 140lb Coldpress 400 Series Watercolour Paper, Fabriano 140lb Hot Press Watercolour Paper, White Embossing Powder, Sequins, Sprinkles, Foam Strips. This is my last Easter card for this year. 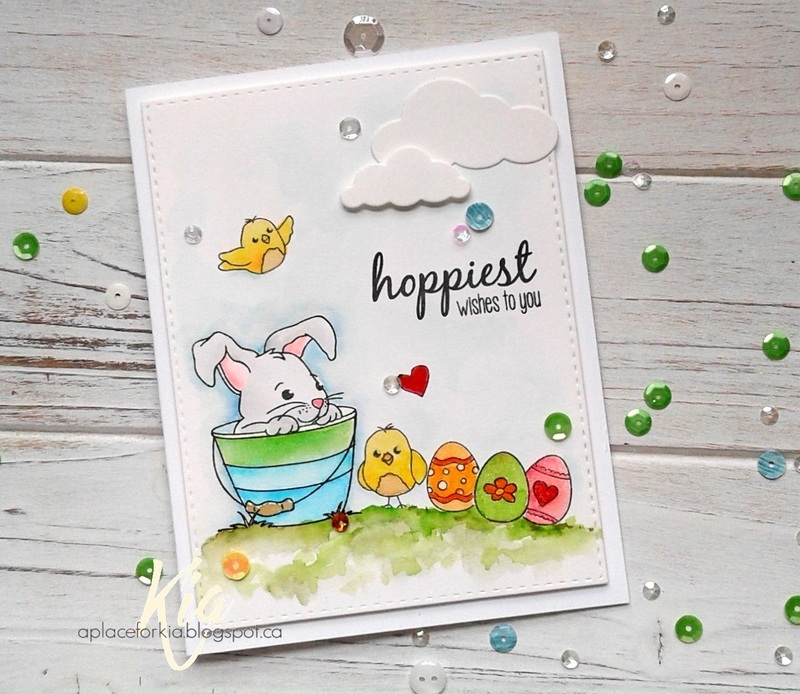 I am always sorry to see the end of cards with bunnies! This little bunny has the cutest face doesn't he? And that little birdie is protecting those eggs ... well that is my imagination at work. 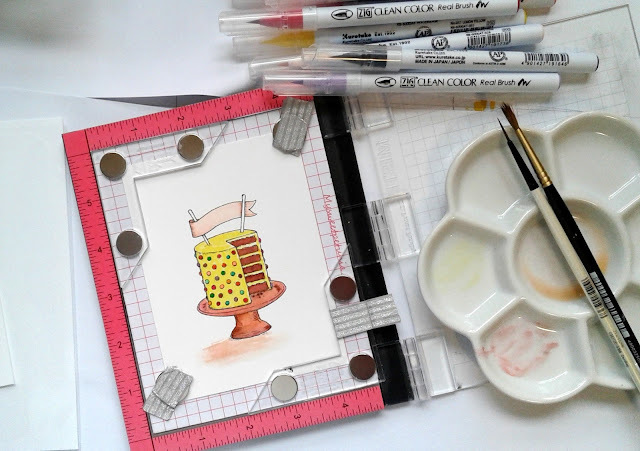 I always arrange my scene in my Misti, stamp and proceed to watercolour inside it as well. 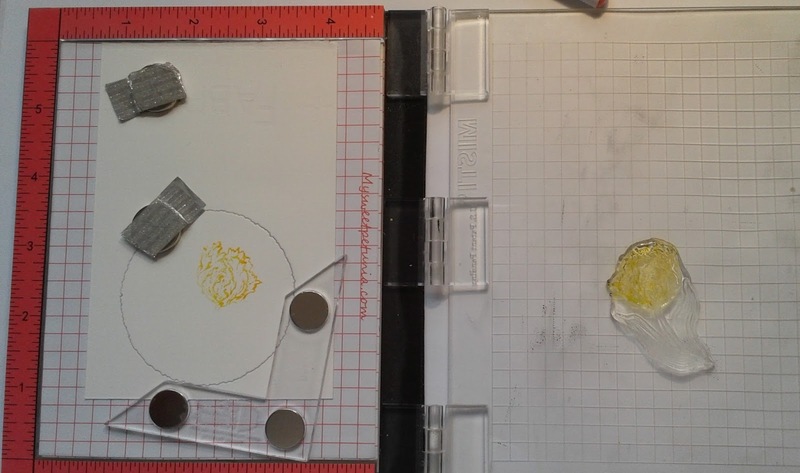 The magnets hold everything in place perfectly. 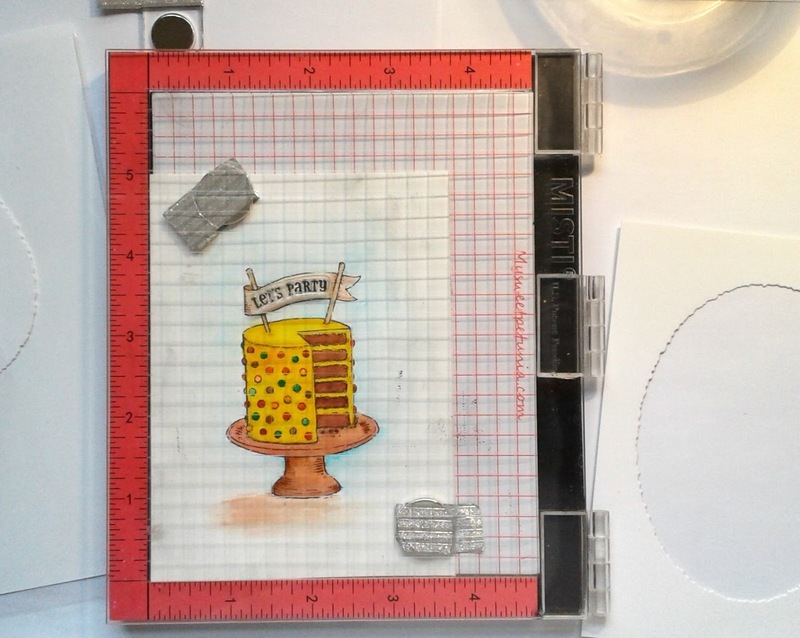 I used my Zig Brushes to watercolour this little scene, and attached the die cut panel to my card base on foam strips. I added the clouds, with one one on foam dots, along with some Wink of Stella to the eggs and a tad on the bunny ears. And, typically me, I added sequins to finish up. 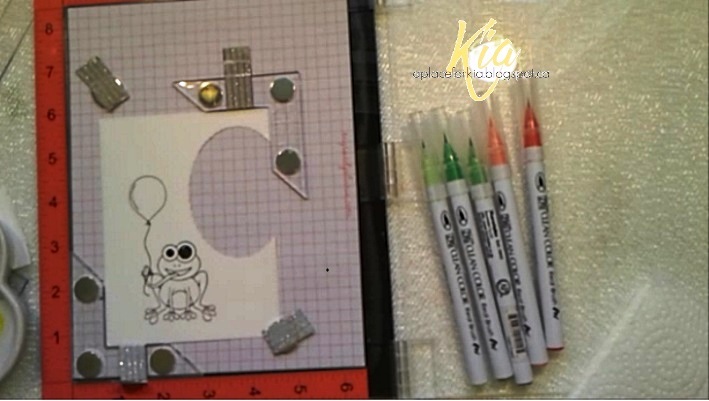 Products: Simon Says Stamp Springtime Critters, Simon Says Stamp Stitched Rectangles, Memory Box Puffy Clouds, Zig Clean Color Brushes, Simon Says Stamp Intense Black Ink, Neenah Cardstock, Fabriano Hot Press Water Colour Paper, Wink of Stella, Foam Strips, Foam Dots, Sequins. Concord and 9th using this special release and a video showing how to use the release. 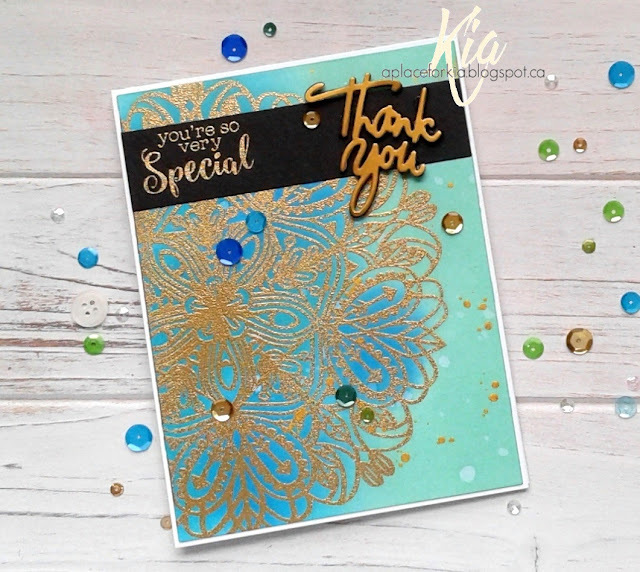 Products: Concord and 9th Triangle Turnabout and Many Mandalas Stamp Sets, Concord and 9th Many Mandalas Die Set, Tim Holtz Distress Inks Twisted Citron, Cracked Pistachio, Salty Ocean, Blueprint Sketch, Crimper, Neenah Cardstock, Paper Garden Cardstock, Sequins. A couple of cards to share with you from Easter. I used felt to die cut my bunny, and attached it to a bunny cut from cardstock, and attached on foam dots. I did the background with my Background Leaves stamp, and added a couple of nested eggs, along with the hill of grass. As I made this for a guy, I added dew drops instead of sequins. 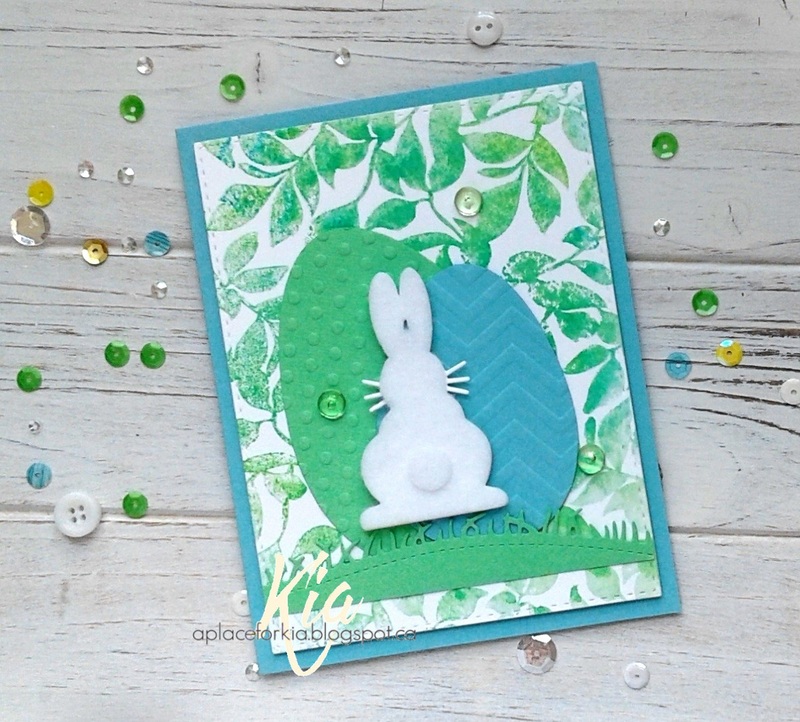 For this card I used the nested eggs that were embossed and a stencilled egg that I attached the bunny to. There is also cardstock behind this bunny to keep him secure. I added the sentiment, twine, sequins and a pearl for the bunnies eye. Products: Frantic Stamper Bunny Back, Frantic Stamper Stitched Grassy Hill Edgers, Impression Obsession Chocolate Bunny, Simon Says Stamp Leaves Background Stamp, Simon Says Stamp Oval of Flowers Stencil, Simon Says Stamp Easter Greetings Stamp Set, Spellbinders Nested Eggs, Cuttlebug Embossing Folders D'Vine Swirls and Polka Dots, Darice Embossing Folders Crackle and Chevron, Neenah Cardstock, Paper Garden Cardstock, My Favorite Things Tranquil Textures Paper, Tim Holtz Distress Inks Twisted Citron and Peacock Feathers, White Felt, Dew Drops, Doodlebug Twine, Sequins. 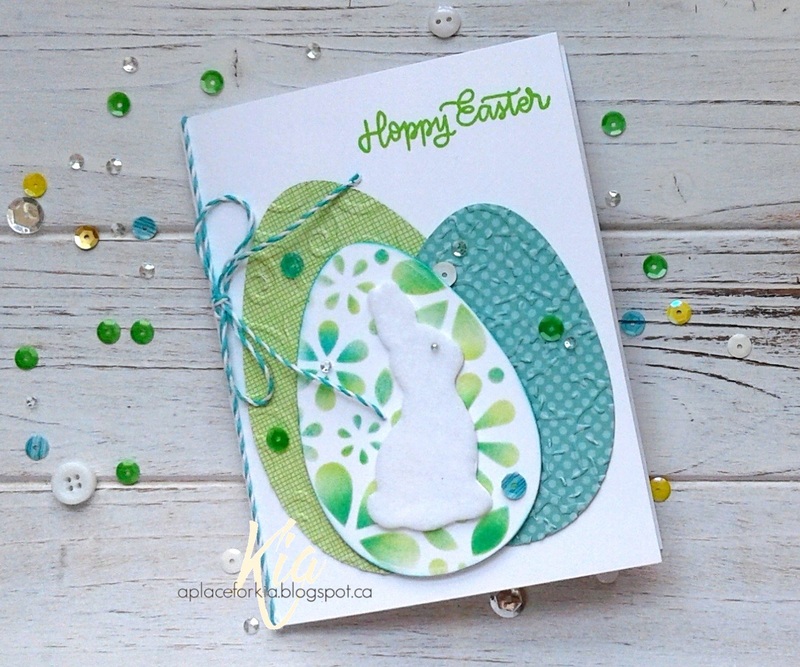 I am adding this card to the April CAS Watercolour Card Challenge to use green and pink. 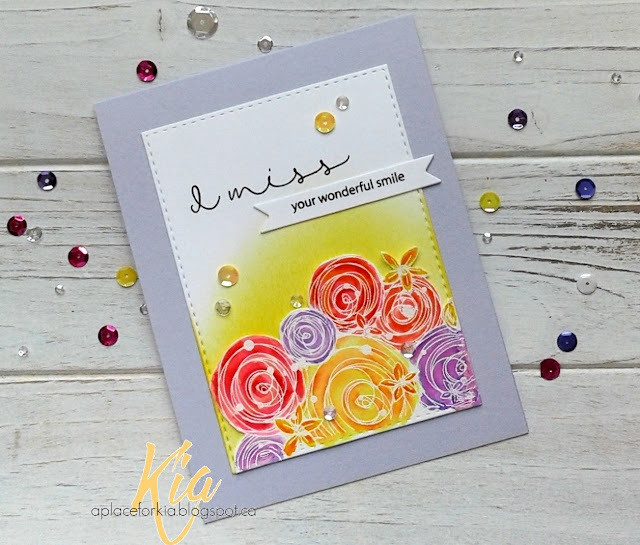 Products: Altenew A Beautiful Day Stamp and Die Set, Altenew Majestic Blooms for the sentiment, Simon Says Stamp Stitched Rectangles, Altenew Olive and Parrot Inks, Do-Craft Markers Pink, Light Pink, Yellow and Soft Yellow, Lawn Fawn In The Meadow Designer Paper, Neenah Cardstock, Fabriano 140lb Hot Press Watercolour Paper, Foam Strips and Dots, Wink of Stella, Sequins. 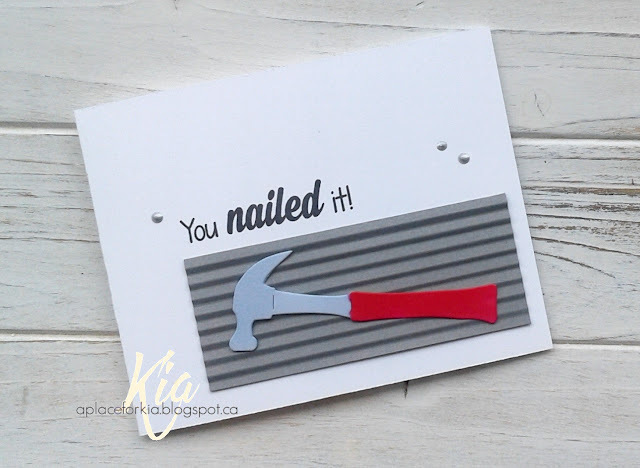 I would like to share with you the cards I made for the latest release from Frantic Stamper called Dads and Grads. I picked the Dad's side of the release for my cards, which can be used for most any kind of card, even the ladies. I personally have a red drill and a red tape measure, and I would really like my hammer to have a red handle like the one above. 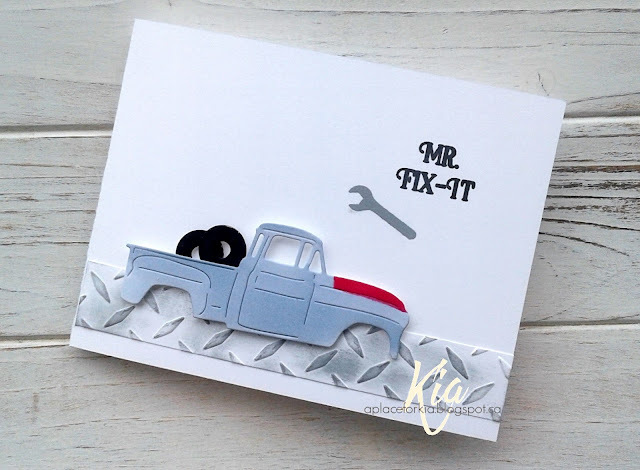 When I saw this truck die I knew how I would present it on my card. Having been raised around car buff's, when I think of Mr. Fix It, it usually entailed a "classic" vehicle being rebuilt. I have to say I love this card. I love the ruler die and I love the tape measure with their fabulous details, and the sentiment is great. A clean and simple design which I think is cute. 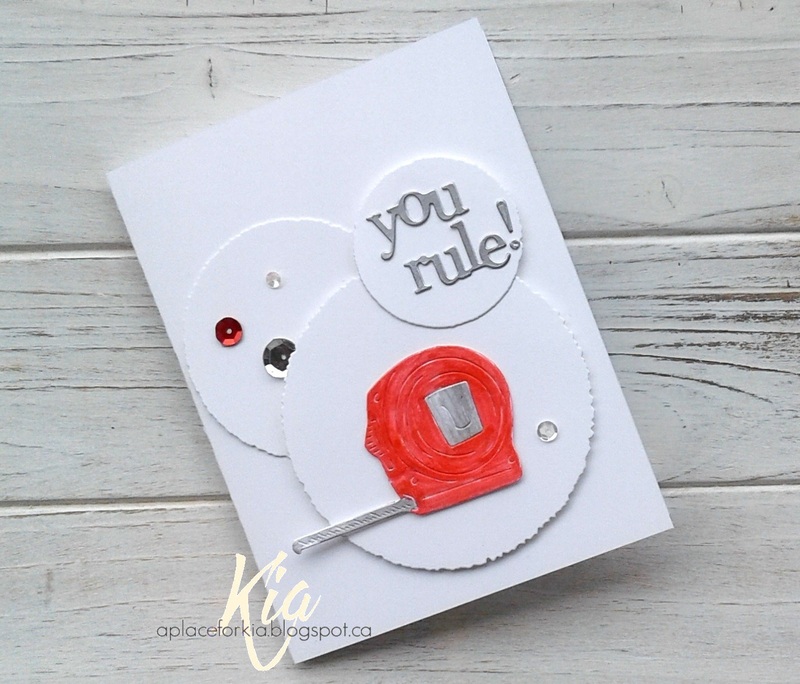 You rule - so fun with the Deckled Ovals. I hope you enjoy these cards and that you will visit Frantic Stamper to view the other dies included in this release. Products: Frantic Stamper Tape Measure, Frantic Stamper Ruler, Frantic Stamper Hammer and Wrench, Frantic Stamper Large Bob's Old Truck, Frantic Stamper Deckled Ovals, Frantic Stamper Deckled Circles, Frantic Stamper You Rule, Frantic Stamper Tool Time Sentiments, Darice Diamond Plate Embossing Plate, Silver Embossing Powder, Martha Stewart Glitter Markers, Spectrum Noir Markers, Chameleon Markers, Crimper, Sequins, Foam Strips. 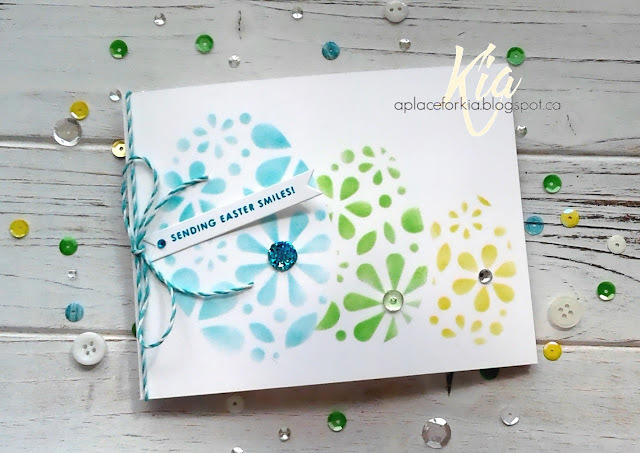 A clean and simple Easter card to share with you today that I made with masking and a stencil. I used my Spellbinders Nested Eggs to do the masking and the Simon Says Stamp Oval of Flowers stencil. 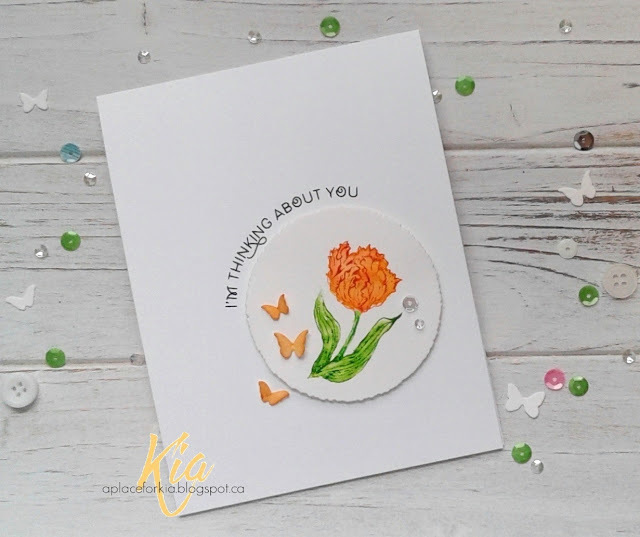 The colours are Tim Holtz Distress Inks in Peacock Feathers, Twisted Citron and Fossilized Amber. I added the Bo-Bunny gems along with a dew drop and a bit of twine. I stamped my greeting on the label die and added a gem for good measure! A quick card, but I think very pretty. Products: Simon Says Stamp Oval of Flowers Stencil, Simon Says Stamp Easter Greetings Stamp Set, Spellbinders Nested Eggs, Tim Holtz Distress Inks, Frantic Stamper Label Die, Bo-Bunny Gems, Dew Drops, Doodlebug Twine. More fun for you today with a hop between My Sweet Petunia and Power Poppy. To celebrate this collaboration, we have a giveaway for you. From My Sweet Petunia your choice of either the Mini Misti or the Original Misti, and from Power Poppy there are 2 gift certificates of $25.00 each for 2 winners. 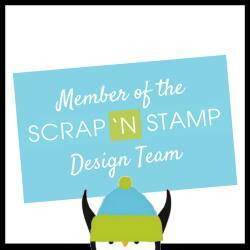 For your chance to win be sure to visit the designer's blog on each team and comment. (one comment per blog). Now on to the fun part. I made a couple of cards to share with you today. I love both of the stamp sets and the beautiful details found in each. First up is Party Time. 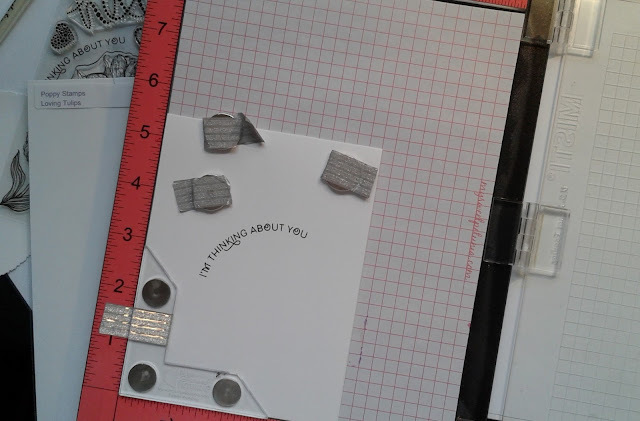 I die cut a piece of Neenah cardstock and arranged in it in my Original Misti along with the die that I was going to use. 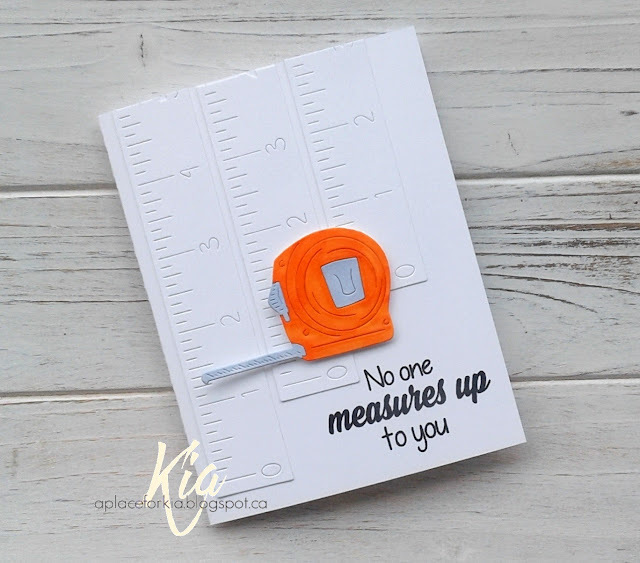 To help with aligning my die I used the L-Shape Ruler that comes with the new Creative Corners. 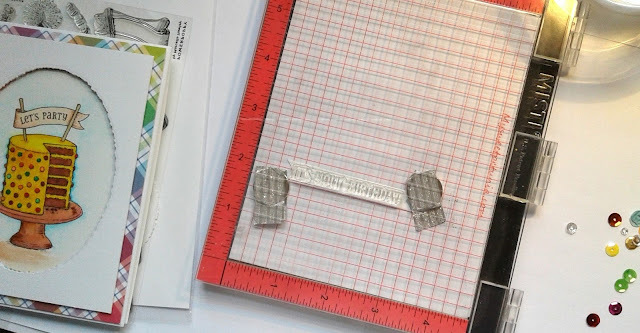 To secure for cutting I taped the die. I then cut my piece of water colour paper and with the same die centered the die in my Mini Misti and arranged my stamp. I stamped my image and secured the paper with my Creative Corners and proceeded to water colour with Zig brushes. I did the colouring in layers to achieve the deeper colours I wanted. Why I love my Misti # 1 is precision stamping, no matter the size, shown with that tiny sentiment in that tiny spot, stamping three (3) times for perfect results. 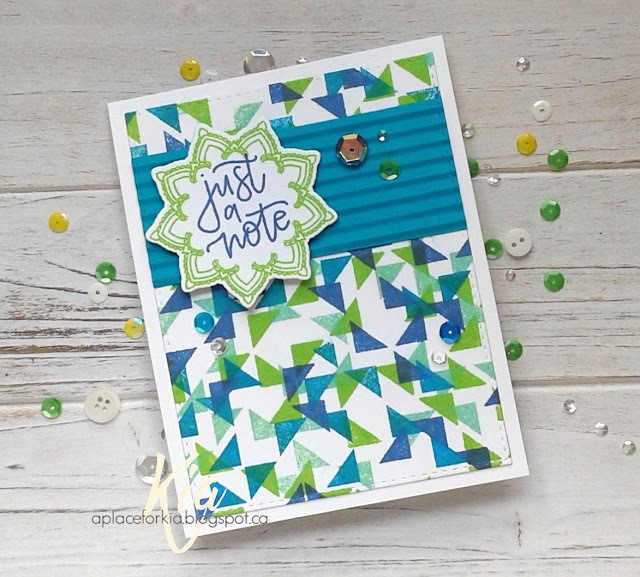 Another narrow stamp, not a problem with my Misti. 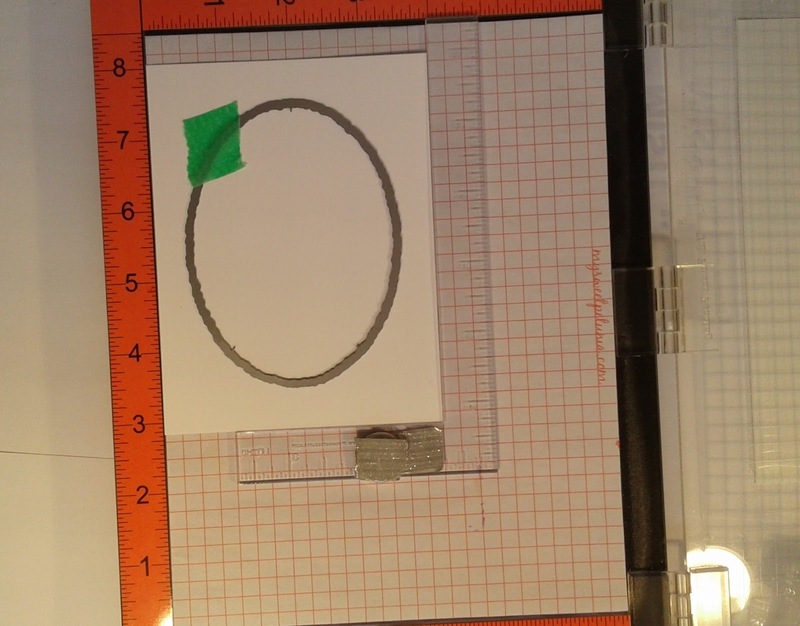 To finish my card, I attached the image to my card base, and die cut the deckled oval from the plaid paper and attached. For the top panel I added foam strips before attaching and to finish I added the label and a few sequins. For my second card I went with a very CAS design, my favourite using the beautiful Loving Tulip. 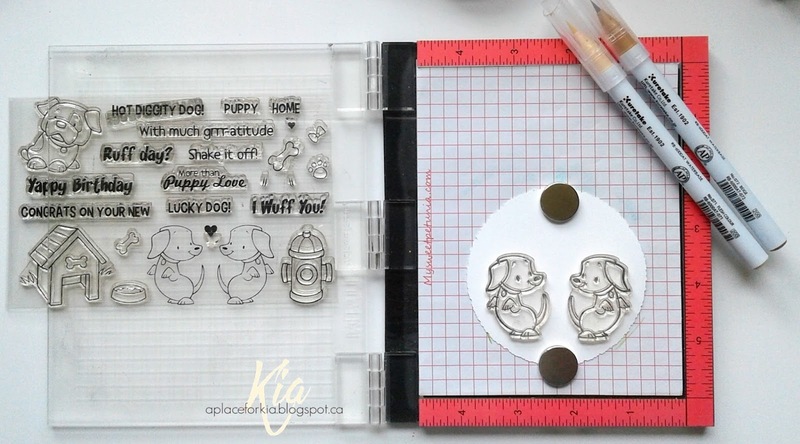 I arranged my water colour paper in my Mini Misti securing with a creative corner and magnet and arranged the placement of my stamp. I coloured my stamp with Zig brushes in yellow and stamped two (2) times. I did not spritz with water as I would do if I were using markers to colour, as there is enough liquid in the Zig for what I want to do. With my aqua brush I then pulled the colour in to the shape of the stamp, then dropped in a light carmine and used my heat gun to dry. I then stamped the leaves using the same method. Once dry, I coloured my stamp using Carmine Red and stamped a couple of times to get a deep colour, then left to dry. In my Original Misti I arranged my card base along with the circle die, and arranged my sentiment. 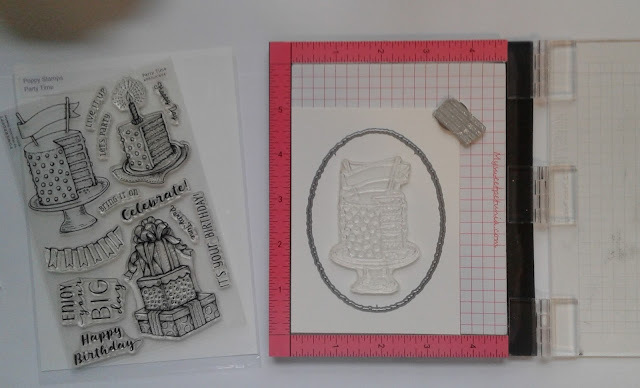 Once I picked up the stamp with the Misti lid I could then curve each side a little more for my circle placement and inked, stamping a few times for a good impression. 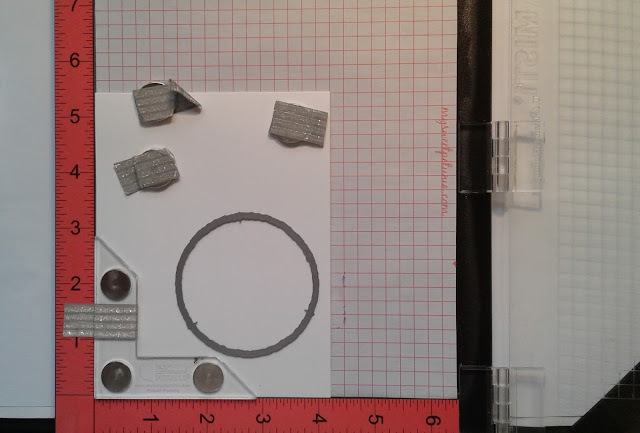 I attached the circle die on foam strips, and added a few butterflies and some sequins to finish. I hope my process has been helpful and thank you for stopping by. 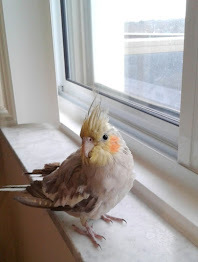 Now it is time to head on over to Kathy's blog. Following is the list for the hop. Be sure to comment on each blog for your chance to win. Products: My Sweet Petunia Mini and Original Misti, My Sweet Petunia Creative Corners, Power Poppy Loving Tulip, Power Poppy Party Time, Frantic Stamper Deckled Circles, Frantic Stamper Deckled Ovals, Frantic Stamper Label Die, Memory Box Butterfly Delights, Neenah Cardstock, Carta Bella Paper, Fabriano 140lb Hot Press Water Colour Paper, Zig Clean Color Brushes, Foam Strips, Sequins. 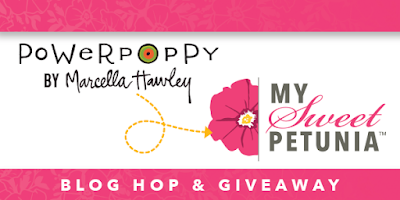 It is time for another blog hop, and a blog hop means some giveaways. Today I am excited to say that we are collaborating with Joy Clair Stamps. To celebrate, there is a giveaway. From My Sweet Petunia a choice of the Mini or Original Misti, and there are 2 gift certificates of $25.00 each from Joy Clair to be won. On April 14th the Misti winner will be announced here, and the Joy Craft winners will be announced here. I made a couple cards for today's hop. The first using the toadally adorable Hoppy Birthday. 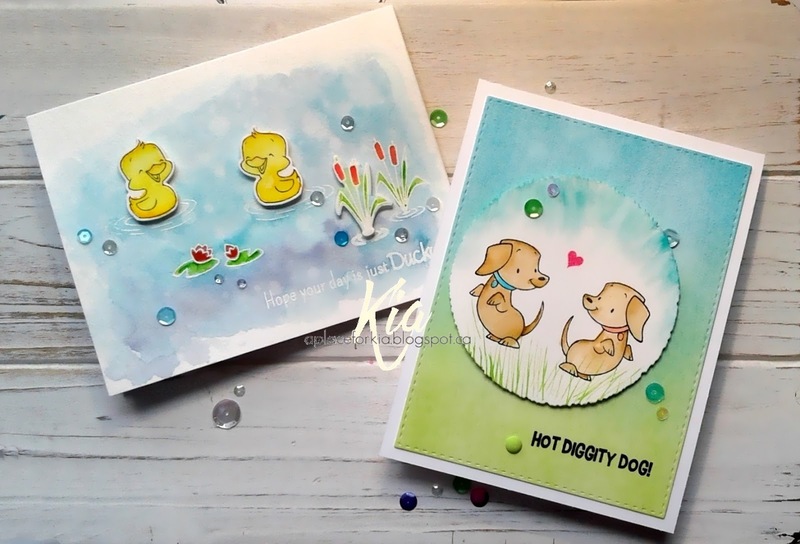 I stamped the image using my Misti and the new Creative Corners. I am using water colour paper here, and I had already die cut the oval for the sentiment portion of the card. Once the image was stamped I placed it back in my Misti and water coloured using my Zig brushes. 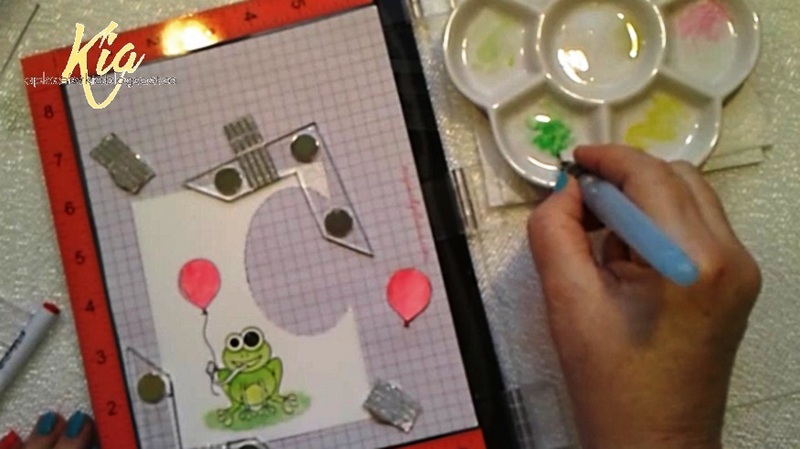 I use the Creative Corners to secure the paper as I paint. My finished card. I added the background paper and the sentiment, along with a second balloon attached with a foam dot and painted with Wink of Stella, along with my trademark sequins. 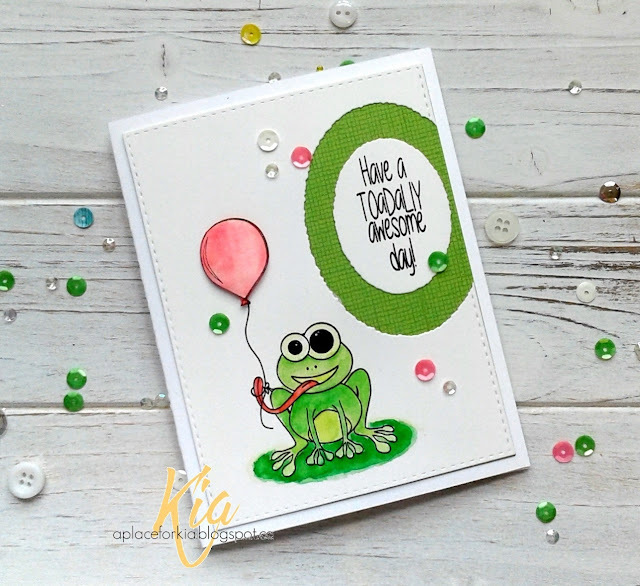 For my second card I used the delightful Hugs and Smiles Stamp Set. I photographed as I did the card, starting in the upper left I decided on my layout and colours. I decided I would fussy cut the flowers, so heat embossed the image on a piece of scrap water colour paper using white embossing powder. I coloured with Zig Brushes, then fussy cut the flowers. I die cut a piece of Neenah cardstock, using stitched rectangles and arranged where the flowers would be before proceeding to brush on yellow ink for my background colour. 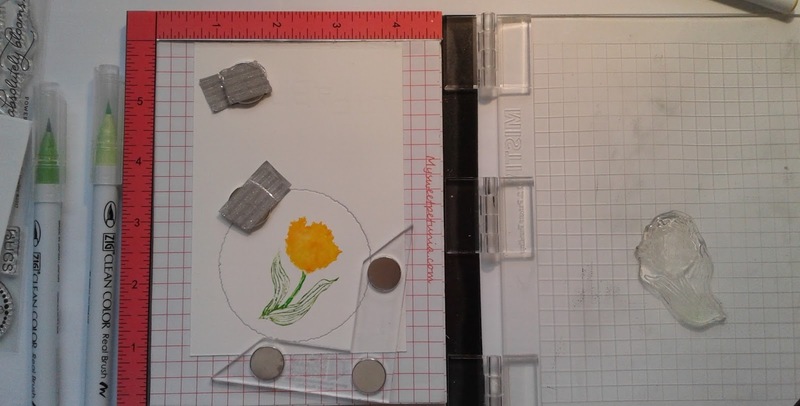 Once I was happy with that, I attached the flower panel to the Neenah and then to the card base. I added the sentiment, with part on a label die cut, and a few sequins to finish my card. I hope you enjoy these cards and my process. 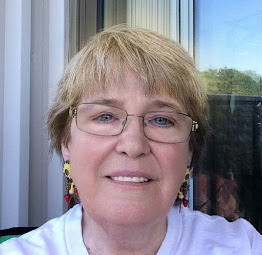 Thanks for stopping by and now it is time for you to head to Donna's blog. Products: Original Misti, Creative Corners, Joy Clair Hugs and Smiles, Joy Clair Hoppy Birthday, Frantic Stamper Deckled Ovals and Label Die, Simon Says Stamp Stitched Rectangles, My Favorite Things Tranquil Textures Paper, Neenah Cardstock, Paper Garden Cardstock, Zig Brushes, Tim Holtz Distress Ink Mustard Seed, Clarity Brushes, Wink of Stella Brush, Foam Dots, Sequins.